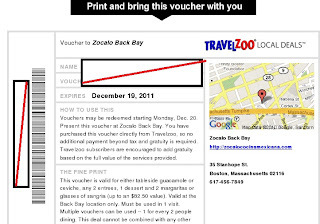 My friend Nat and I discovered Zocalo Back Bay through a Travelzoo local deals that get delivered via email to me periodically. The deal was $35.00 for 3 courses of food not including the house chips and salsa. Back Bay location only. Must be used in 1 visit. 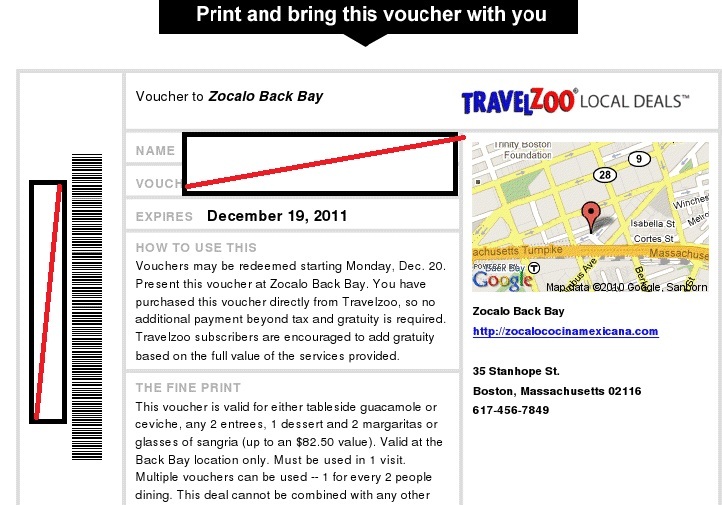 Although we bought the voucher LAST DECEMBER of 2010, we waited until days before the coupon was about to expire before we were forced to use it. The restaurant was cozy and almost empty upon our arrival at 6:30 PM. Nat and I had a margarita and sangria respectively, and the guys stuck with Mexican beer. One of the guys ordered their beer "Michelada" style which was mixed with a spicy concoction and served in a rimmed mason jar. Although the drink looked pretty cool, he didn't like it very much. Upon seating, we were immediately served house chips and salsa. Since we had two vouchers to use, we ordered both the ceviche and tableside guacamole. I imagined the "tableside" guacamole would be prepared right at our table similar to other authentic Mexican restaurants, but their guacamole was prepared at a small station in the dining room among the tables. All three starters were tasty! My friend Nat even ate the guacamole sans chips since she is a big fan of avocados. For dinner, we all ordered separate dishes including. I love the Chili Rellenos at the Border Cafe , but I was a bit apprehensive to order it at Zocalo since one of the chili's was stuffed with raisin and spinach. The waitress assured me it was good so I decided to give it a try. I was completely taken back at the texture and taste of the stuffed chiles. Who would have though spinach, almonds, raisin and cheese would be so heavenly together? The plantains and pyramid molded rice was a nice added touch. I was definitely happy with my meal. My friend Nat ordered the Carnitas braised pork. For some reason, we both thought it would be served similar to pulled pork. She gave me a sample of the pork dish and it was tender, flavorful and delicious. The guys ordered the "Pescado", pan-seared marinated fish with mango-pineapple salsa and "Arrachera", grilled skirt steak. They both seemed indifferent to their meals. Finally, after we were already stuffed with tortilla chips, appetizers, and our entrees, we forced ourselves to the two desserts included in the voucher. The traditional Flan and "Tres Leches" (three Milk cake) were both amazing! The three milks used to make the dessert are condensed milk, evaporated milk and heavy cream. (Not so great for the waistline) We usually do not order desserts so we were glad we got to try something different such as the later. I never knew a dessert made based on milk would be so tasty! When we received our bill, the restaurant was packed and there were people waiting for tables. it was amazing to see how quiet it was to a boisterous jam packed little restaurant. We were happy to get there early and got seated right away. The food was absolute delicious but the menu and drinks were on the pricier side. I would definitely visit again if I had another coupon or voucher, but I probably won't pay full price for a meal if I had to.